The "Free Flyte Elite" is a CNC machined version of our popular Free Flyte arrow rest. This rest can be mounted with the conventional side plate or the riser can be drilled and tapped for the ultimate in stability. The dual magnet system will allow for both inward and outward movement of the heavy-duty arrow support arm. There are two positive locking vertical and horizontal adjustments that allow each archer to set this rest up to fit any bow and make quick positive changes for each set-up and arrow diameter. 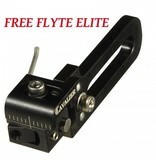 This is the ultimate finger style rest for the serious target archer or hunter. The Free Flyte Elite rest must be used with a plunger. We recommend using either the Master Plunger or Master Plunger Micro for an unbeatable combination.